Tough luck Colaba. 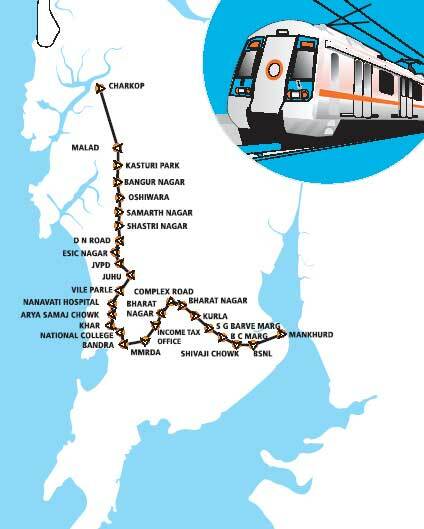 The Colaba-Charkop metro rail leg has been changed to a Charkop-Bandra-Mankhurd route. Completion date..oops, no change here. Plan to build the Colaba-Charkop line was shelved after it was found that the part-underground, part-elevated line would be financially unviable. The Rs 9,000 crore-line would cost an additional Rs 2,000 crore if it were made underground till Mahim (earlier, it was till Mahalaxmi). The new corridor, which will be entirely elevated, will be cheaper and can also be built faster. Originally, the Bandra to Charkop arm had been part of the north-south Colaba-Bandra-Charkop route, which is now being tweaked—more portions will be underground—following objections from the Mumbai Heritage Conservation Committee. Note that this is just a change in the route and does not mean anything in terms of progress on execution of the project. So the only thing that's happened is that the MMRDA has changed the route and the Chief Minister (also the Chairman of the MMRDA) has approved the change. The project will now go the State Cabiner for approval. Given the size and the cost of the project, it will most likely run into some kind of hurdles such as sharing of the costs, etc, etc. MMRDA has also estimated viability gap funding at Rs1,658crores. While current news articles suggest that this amount will be borne by the State Government, do remember that work on the Versova-Andheri-Ghatkopar leg had been stalled over this issue. Given that the BMC elections are due soon, one can expect headlines to keep coming steadily on the approvals received and projects flagged off by our politicians on infrastructure projects for this city. Back-patting stuff that their hoardings are made of. And what of real work done and benefits achieved ? Wait till 2011 for that. Technorati tags: India, Mumbai, Metro Rail, MMRDA. India Today carried an article on Bombay bloggers, featuring Govindraj Ethiraj, Arzan Sam Wadia, Amit Varma, Peter Griffin and..er..self. Arzan has a post on it (link here, thanks Arzan) with a scan of the article done by his sister Mehernaaz (thank you). For reasons best know to them, India Today got my URL wrong - it is not http://mumbaimatters.blogspot.com. In fact I had tried for that URL when I first started out this blog, but at that point it was taken. Despite that, even now, as it was then, if you click on that link, you are greeted with "Not Found". At the photo shoot, I was hoping to meet up with Govind - a blogger that I, along with many others, have a lot of respect for - but unfortunately he couldn't make it. And talking of respect for bloggers, I'm wondering why an article on Blogging in Mumbai didn't even have a mention of Dilip D'Souza and Sonia Faleiro. The piece below appears in this week's Hafta. If it was a company, you could blame it on the consultants. Considering that Mumbai contributes close to US$9bn (Rs40,000 crores) annually in tax receipts to the Central and State Governments, it would make for one hell of a large company. In case you’re wondering where that number above came from, it was provided by M/s McKinsey & Company, in a joint report done by that leading consultant firm and Bombay First a corporate backed lobby group. "Mumbai ’s aspiration is to become a world-class city in the next 10-15 years. In order to achieve this, it needs to be distinctive on the dimension of economic growth and above average on quality of life. It will, therefore, need to step up economic growth to 8-10 per cent by becoming one of Asia’s leading service hubs, with a fast-growing manufacturing base in the hinterland. On the quality of life dimension, comparing it to the benchmark cities revealed that it needed to move from average to above average on mass transport, from poor to above average on private transport, housing, safety/environment, financing and governance. It will also need to make improvements in the remaining areas, i.e., go from being average to above average in water/sanitation and education and from above average to world-class in healthcare." On receipt of this path-breaking and seminal blah-fest, the Chief Minister promptly constituted a task force to study it and make another report. In less than six month’s time, the Chief Minister’s Task Force came out with its own report (available here) with the same title but its very own “Vision 2013”. Devoid of the professional eloquence that a consultant gets to the table, the best that the CM’s men could come up with, for a vision statement, was this – “Transforming Mumbai to a world-class city with a vibrant economy and globally comparable quality of life for its citizens”. Somewhere after that, 26/7 happened and flash forward to present day, the Mumbaikar remains as harried and hapless as he was before these reports were made. The ironical part is that given the number of consultants appointed by the Government over the years, you’d think that some action would be taken on the recommendations made by these experts. No such luck. The present state of Mumbai’s infrastructure bears testimony to the fact that various state Governments over the years have hired these consultants for Mumbai only to pay lip service. Execution was, and remains, a different story altogether. As pointed out in an earlier Hafta article, the first consultant the city got was M/s Wilbur Smith in 1962. Forty four years later, one recommendation of this committee, viz. the Bandra Worli Sealink freeway project, is finally being implemented. However, the logic for this ambitious freeway in the present day has been questioned by architects and urban activists like Chandrashekhar Prabhu (read our interview with him here). In fact, even the MMRDA has stated that the consultant’s proposals “did not take into account the importance of public transport and did not examine the possibilities of changing the land use pattern to manage the travel demand”. (page 267 of the MMRDA Regional Plan). Next up, we had M/s W. S. Atkins in 1994 who were commissioned by the World Bank, along with ORG and Kirloskar Consultants in 1994 to prepare a Comprehensive Transport Plan for Mumbai. To be fair, this was one of the most comprehensive studies down on transportation in Mumbai, and perhaps even the launching pad of the MUTP. Analyzing data from 1971 to 1991, this report gave us those key statistics exhorted by those in favour of public transport – i.e. 88% of all transport in Mumbai is through public transport, 7% by private vehicles and 5% by taxis. Most importantly, this report had forecast that by 2011 the total number of vehicles registered in Mumbai would double over 1991 levels – or from 0.8m to 1.36m. In all likelihood, M/s Atkins were too conservative because by 2001 itself, registered vehicles in Mumbai stood at 1.29m (per MMRDA). With the Atkins study outdated, the MMRDA commissioned yet another consultant – this time Lea International– to undertake what seems to be the most ambitious transport study done so far. It even has its own name (TRANSFORM) and website. Using responses from thousands of commuters across rail, bus and roads, the 18-month study, costing Rs7crore, will “aim to formulate long term transport strategy for Mumbai Metropolitan Region by identifying requirements of travel till the year 2031.” Surveys for the study have already been completed and a draft investment plan is expected to be put forth for public consultations. Watch this space. Meanwhile, the Central Government (Urban Development Ministry) is also gearing up to decongest cities. Towards the noble task of alleviating commuting woes, the Government has appointed – hold your breath now – M/s Wilbur Smith to conduct sample surveys across 30 cities (Mumbai included), which would be used for a study called Traffic Engineering and Transportation Planning. Code-name TREAT you say ?. And so 44 years after its first study of Mumbai, M/s Wilbur Smith is all set to prepare yet another one on the city. The average Mumbaikar, consigned to crowded trains and traffic jams, can’t be blamed for looking askance at M/s Smith or at the babus and the sarkars who have appointed these international consultants. Between themselves no one has been able to come up with a solution for the city’s transportation problems. So, do forgive our scepticism at vision statements and dreams for world class cities. These grand designs might soothe consultants and politicians, but for Mumbaikars today they are remain bad clichés that have run their course.